MALE, Aug. 31 (Xinhua) -- The China-Maldives Friendship Bridge, the first cross-sea bridge in the Maldives, opened to traffic on Thursday evening. Maldivian President Abdulla Yameen and representative of the Chinese government and head of China's International Development Cooperation Agency Wang Xiaotao attended the bridge opening ceremony. Speaing at the occasion, Maldivian President Yameen said the bridge is an embodiment of the long relations between the Maldives and China. Wang said China and the Maldives have long been true friends, treating each other as equals and pursuing mutually beneficial cooperation. China has always offered help for and supported the Maldives' social development, Wang said. 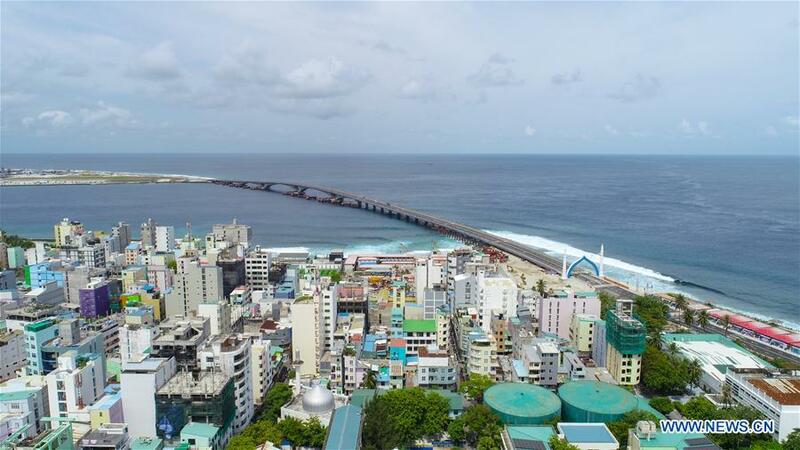 Chief engineer from the China-Maldives Friendship Bridge Project Cheng Duoyun told Xinhua that in the 33 months of construction, the project had achieved a number of key technical breakthroughs. Connecting capital Male and neighboring Hulhule island where the Maldives' main international airport is located, the two-km bridge makes it possible for locals and tourists to transfer between the two islands on land within five minutes. The China-Maldives Friendship Bridge is an iconic project of the Maldives and China in co-building the 21st Century Maritime Silk Road. The construction of the bridge started at the end of 2015, with China's CCCC Second Harbour Engineering Co Ltd. being the EPC contractor.